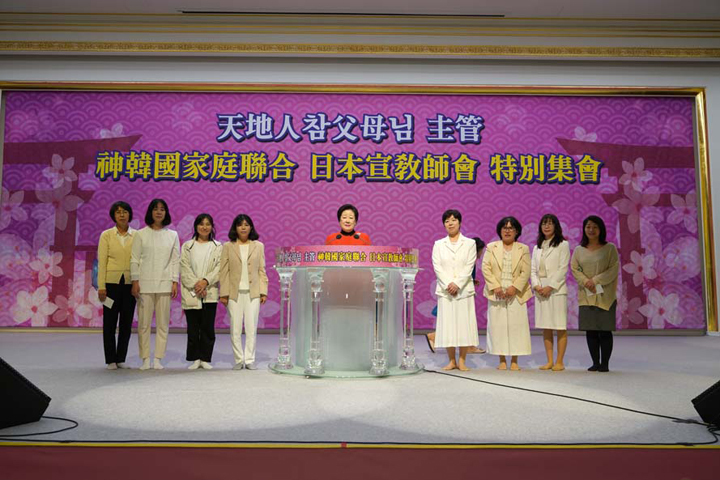 During the blessed season of bearing abundant fruits, the victorious True Parents of Heaven, Earth and Humankind officiated the entire three-day schedule of the 2018 Autumn Hyojeong Cheongpyeong Great Works (Great Works). On the first day (Oct. 19), True Parents visited the training center to officiate the Special Gathering of Japanese Missionaries in Korea (SGJMK). On the 2nd day (Oct. 20), True Parents directly officiated 2018 International Drone Expo, 2018 Hyojeong Offering Ceremony and 2018 YSP Hyojeong International Peace Youth Music Contest. Their grace has revived us from deep within. All the participants felt the love of True Parents. This amazing blessing and endless love of true love became the golden light and spread beyond Hyojeong Cheonwon (HC) to the ends of the earth. We would like to introduce the major news of this event and participants’ testimonies. The Great Works began at 6:20 am on the first day with an opening prayer. 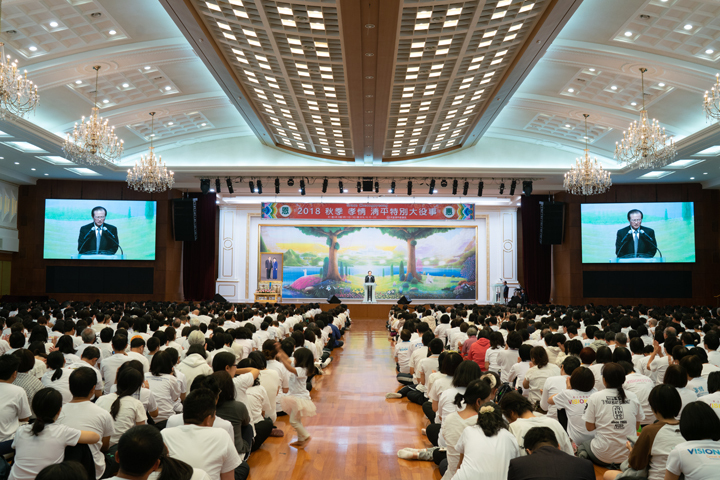 Many worldwide members who are on their way to fulfilling the HTMM gathered at the Jeongshim Won prayer hall to attend the first event of the Great Works. They honored the event with great enthusiasm. 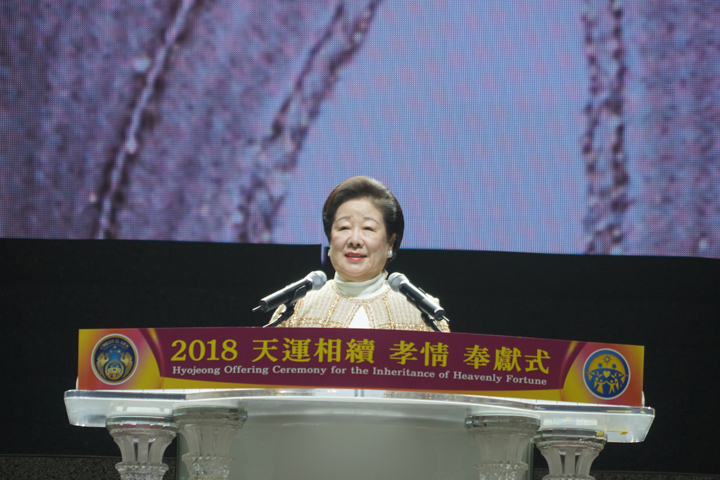 After Vice President Myong-kwan Lee led the participants in song and praise with “Grace of the Holy Garden,” everyone gathered their sincerity, heart and soul and offered their prayers to Heavenly Parent and True Parents with loud voices. 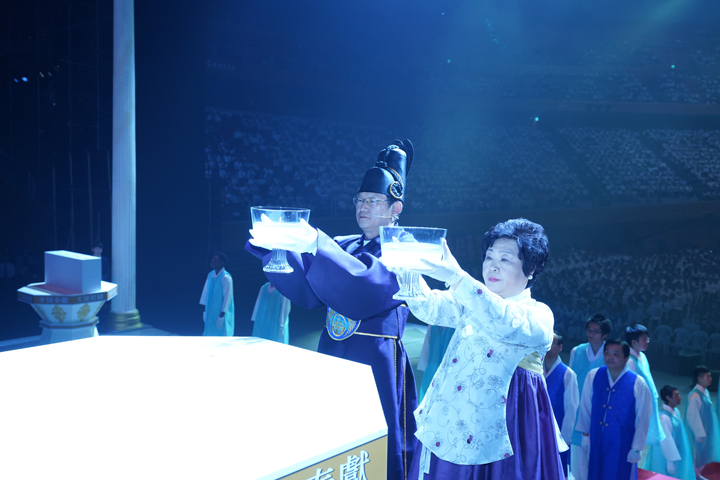 On the second day of the Great Works, the 2018 Hyojeong Offering Ceremony was held with many members from all around the world. Before the Hyojeong Offering Ceremony began, the first chanyang was held. 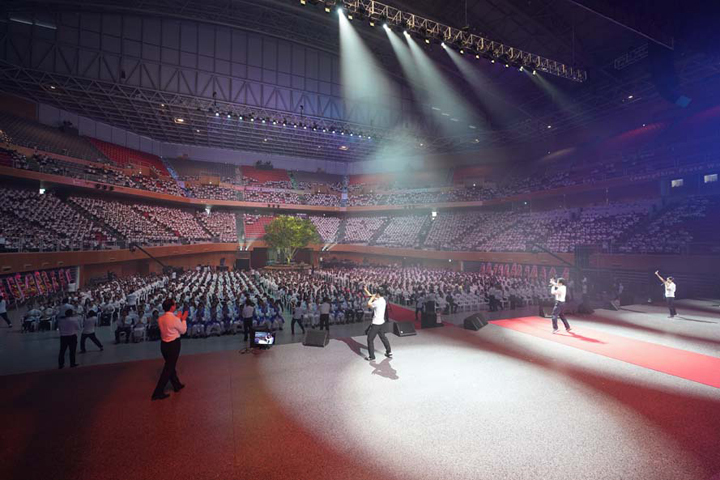 Japanese Section Chief Toshiaki Yokoi and the chanyang team led an enthusiastic chanyang on stage. 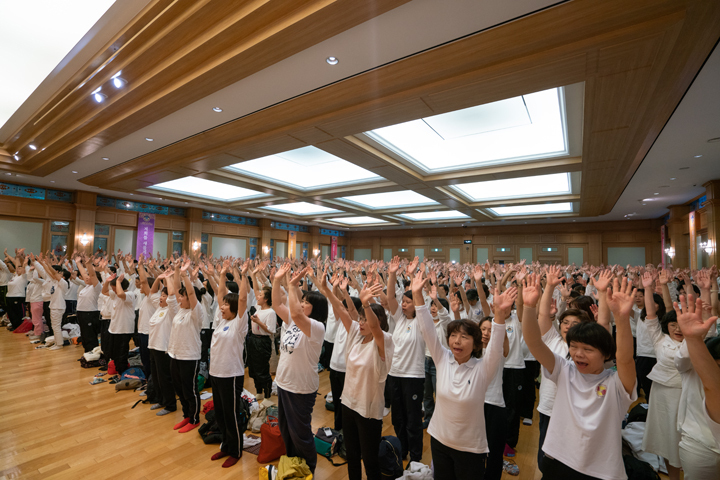 All the families from around the world did chanyang together, singing “Grace of the Holy Garden” with one voice to the sound of drums and keyboard. The vast CSPWC was filled with their enthusiasm. 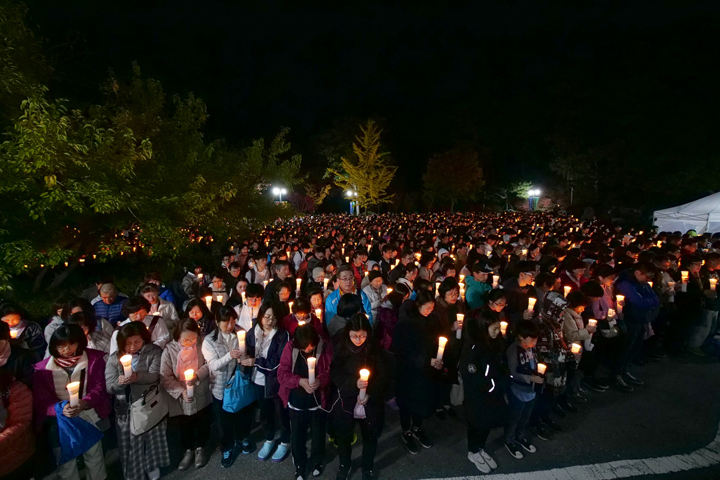 The Tree of All things Prayer was held in the evening on the 2nd day. All the members gathered at the Water of Life plaza making a long line up to the Tree of All Things creating a sacred atmosphere. It was a precious time to repent, reflect and determine to become a blessed central family with the mandate of “have dominion,” the last of Heavenly Parent’s three great blessings. The beautiful light of the inherited holy candles created a sacred atmosphere; each member representing their nation became a revitalized true believer, true providential person, and true principled person. They established their authority within the heavenly direct dominion over all things and angels; and from the position of servants, they restored the parent-child relationship. We are eternally grateful to have established this blessed position here at HC, and for having received overwhelming glory and happiness.